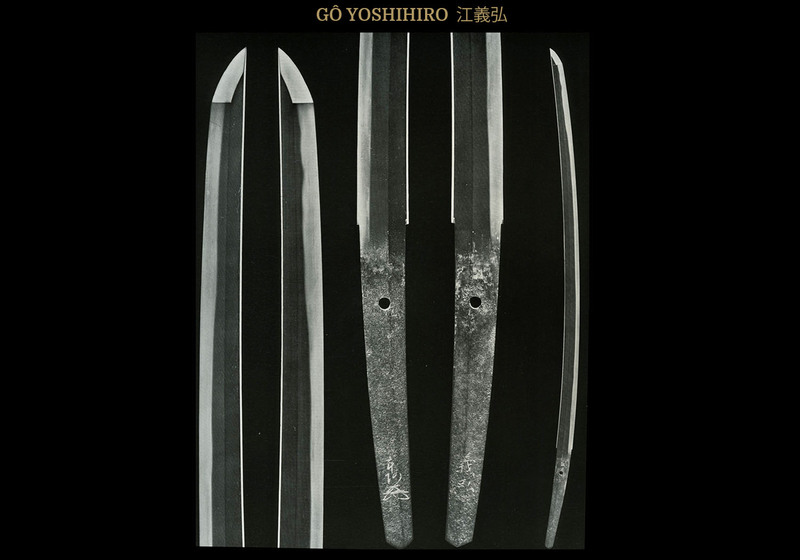 Yoshihiro (義弘) is one of the most famous sword smiths of all time. Yoshihiro’s (義弘) given name was Matsukura Gô Umanosuke (松倉江右馬允) and he lived a short but auspicious life. He was a Samurai of the Tomoi family and served the Matsukura (松倉) in Etchu (越中). Since olden times he has simply been known as Gô (江), the nickname taken from his place of residence. Yoshihiro (義弘) was active around the Genô Era (元應) and that would place him toward the end of the Kamakura Era (鎌倉) and the beginning of the Nanbokucho Era (南北朝). Since the time of Toyotomi Hideyoshi (豊臣秀吉), Yoshihiro (義弘) is considered to have been one of the Nihon Sansaku (three great smiths of Japan), the other two being Masamune (正宗) and Awataguchi Yoshimitsu (粟田口吉光). He is also recorded in the old sword reference books such as Ojakusho and Kokon Mei-zukushi as having been a direct student of Masamune (正宗) and, indeed, is recorded as being one of the famous Masamune Juttetsu or ten famous disciples of Masamune (正宗). In fact, he is generally considered to have been the best of all of Masamune’s (正宗) ten disciples. Gô Yoshihiro (江義弘), died at the young age of 30 in 1330. Even though his life was brief, he left some splendid examples of his work. There have been several theories about where in the major schools of sword making he should be placed. While his early works show definite Yamato (大和) characteristics, I think most scholars agree that he should be placed firmly in the Soshu (相州) tradition based upon his interaction with Masamune (正宗). Since he comes from Etchu (越中) and is a contemporary of the famous smith, Etchu Norishige (越中の則重), some feel that there may have been a teacher-pupil relationship between these two smiths. However, since Norishige (則重) is also generally considered to have been one of the ten great students of Masamune (正宗), I think it much more likely that they were fellow students rather than teacher-student. I think the similarities in the works of Yoshihiro (義弘) and Norishige (則重) can be attributed to the fact that both studied under Masamune (正宗). As with the smith, Shizu Kaneuji (志津兼氏), swords exist from Yoshihiro (義弘) that are dated to a time before his study under Masamune (正宗). Early blades such as these show a strong Yamato (大和) influence. 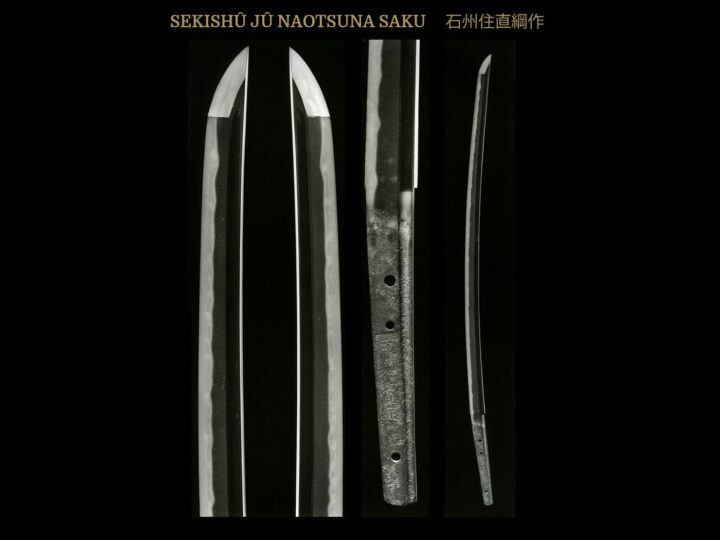 Blades made after his studies with Masamune (正宗) began show strong Soshu (相州) characteristics, as one would expect. 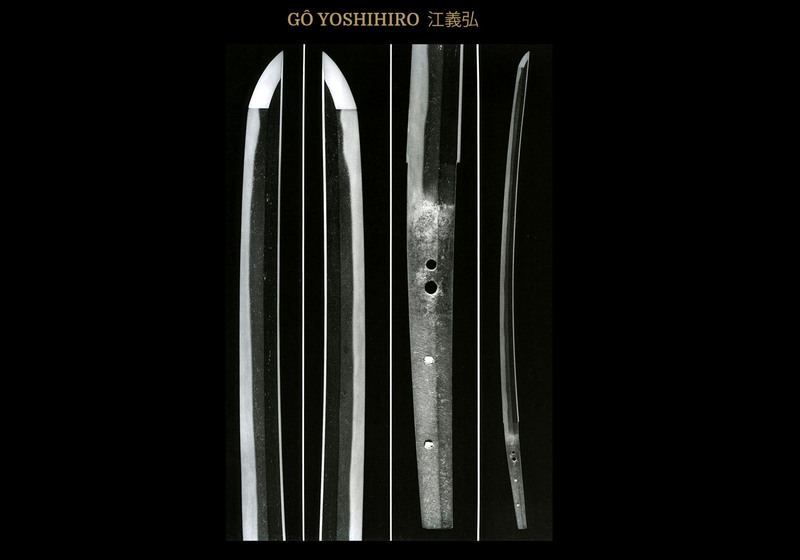 Yoshihiro (義弘) is considered to have been not only the best of Masamune’s famous students, but the workmanship in his blades is considered to be vary faithful to the style of Masamune (正宗), perhaps more so that any of Masamune’s other students. 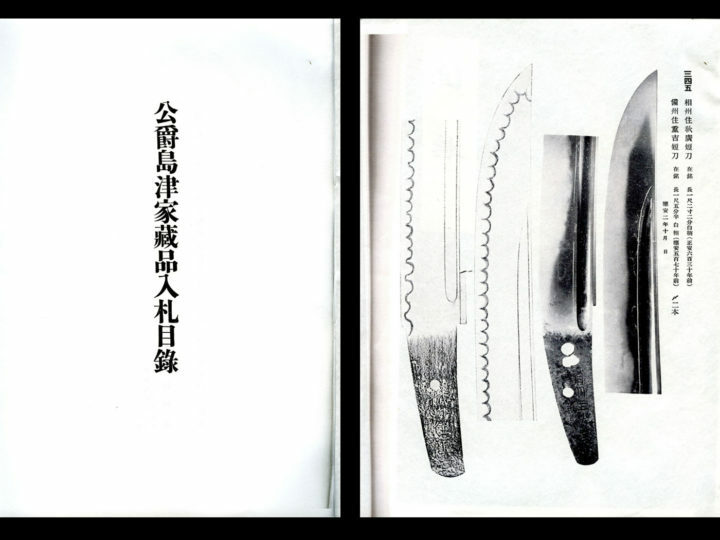 Many of the blades by Gô Yoshihiro (江義弘) have been given names. 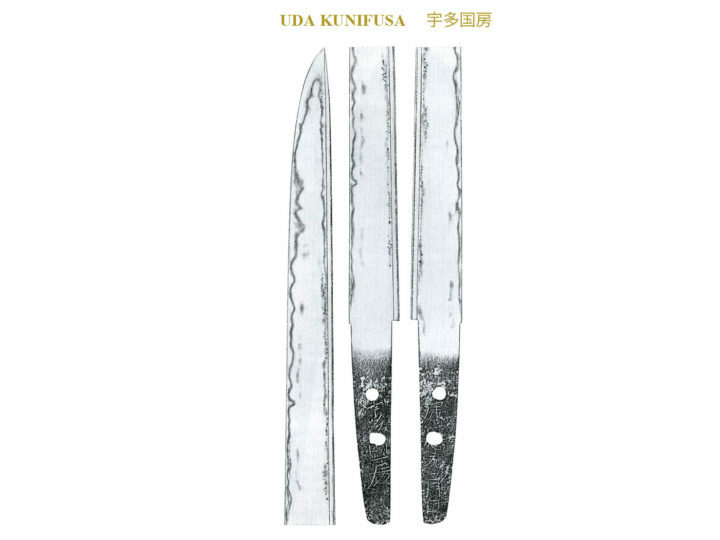 These names given to Gô blades are not new as proven by the fact that many named Gô (江) blades are listed in the old sword reference books from the Edo period and before. Unfortunately, the reason behind the naming of some of these blades has been lost through the years. Most names were derived from the famous owners or from the owner’s place of residence. SUGATA: The shape of his tachi will be that of the late Kamakura and early Nanbokucho Era. The sori will be a slightly shallow torii sori, though since all of his tachi will have been shortened, it is not easy to visualize their original gracefulness and stature. There are some that are hira-zukuri, but most are shinogi-zukuri, some that are slender, and some that have a wide mihaba with an extended kissaki, but not an o-kissaki. There are a small number of shobu-zukuri wakizashi but no tanto have been authenticated to date. JITETSU: The kitae will be ko-itame mixed with nagare-hada. Ko-mokume will also be found on occasion. His early blades will have a strong showing of masame-hada. The ji-hada will resemble that of the Awataguchi School with an appearance of ‘wetness’ to it. Ji-nie will be fine. The nie will become thicker in the area between the ji and the ha, and it will turn into chikei and yubashiri. HAMON: Most of his hamon consist of a shallow notare mixed with a suguba. The nioi formations are deep, and the nioi-guchi is bright and clear with the presence of kinsuji. There will be much nie within the yakiba and at its edge. It will be kuzure in areas and in these areas there will be long and deep ashi as well as inazuma and kinsuji. The depth and color of Yoshihiro’s nie is considered to be one of his supreme accomplishments and the workmanship rivals that of his great teacher, Masamune (正宗). BÔSHI: Yoshihiro is known for his ichi-mai bôshi, but all of his works do not have it. The bôshi is either going to be ichi-mai or komaru with kaeri. Within the bôshi the nie will be deep and the tempered area will be wide. HORIMONO: Bo-hi will be seen on occasion. NAKAGO: All works are suri-age with all or most of the original nakago being lost. Generally, we find the jiri being kengyo in shape, but occasionally kurijiri and kiri will be found. Kengyo is the most common and is what we find on the blades of Masamune (正宗). 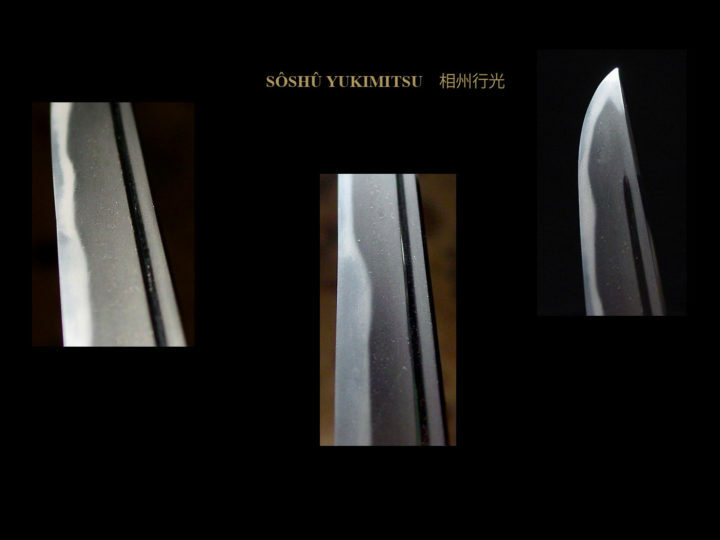 Often we find shu-mei (lacquer attributions) on Yoshihiro’s blades. MEI: No signed examples exist.